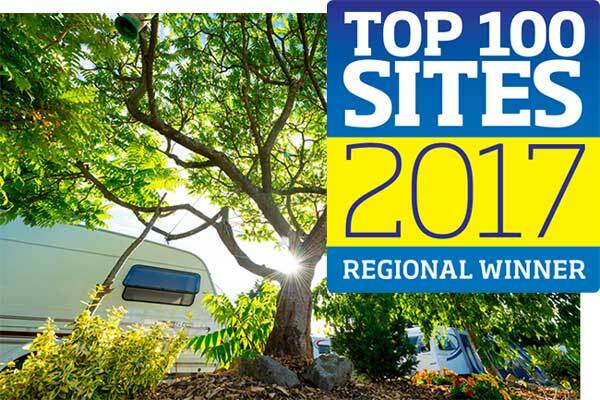 UK's Best Adults Only Caravan Park for the 10th time. The entire park team are delighted that their attention to detail and customer care have been recognised in these top awards every year since 2000. That is, in addition to being voted the UK's Overall Winner three times. "Not too big, personal and quiet." "Peace and tranquillity, a really well-kept site with good walks and friendly staff." "Peaceful, beautifully maintained in a picturesque village location." Best Open All Year Park! The whole team are delighted that their efforts have been recognised in the top awards every year since 2000, as well as, having been Overall Winner three times. "Quiet, tidy, attractive and very well maintained. The staff are very friendly and helpful, but unobtrusive." Download our Top 100 Sites Review. Thank-you to our wonderful guests who voted for Bath Chew Valley Caravan Park in this years' awards. Once again we were awarded the Regional Winner! "It is a really well-kept site: very clean and tidy. The toilet/shower block was the best we have ever seen. It was like having individual en suites. The staff were very friendly." 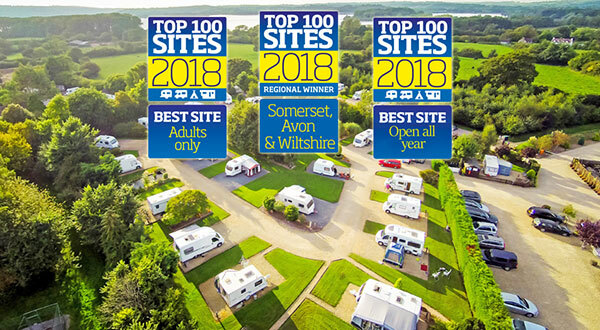 Best Adult Only Caravan Park in UK and Best Caravan Park in Somerset for the 8th consecutive year. The whole team will be delighted that their efforts have been reconised in the top awards every year since 2000, as well as, having been Overall Winner three times. Regional Winner, Somerset and Best Adult Only Caravan Park UK for the 7th consecutive year. This makes us the only caravan park to win top awards every year since 2000, as well as, Overall Winner three times. "This is a well-kept site with lovely pitches, set in nice surroundings. The location is excellent for visiting Bristol, Bath, Wells and nearby areas. The site, showers and toilet facilities are immaculately kept." "The whole site is well laid-out, clean and very tidy. The woodland walk is excellent." "The best site I've ever stayed at by far. It's quiet and beautifully set-out, with generous pitches. No one is squeezed in. Toilets and showers are spotless. Five stars!" "The staff park your caravan - that was brilliant, because I am totally new to towing!" Download our Top 100 Sites Review (840kb). 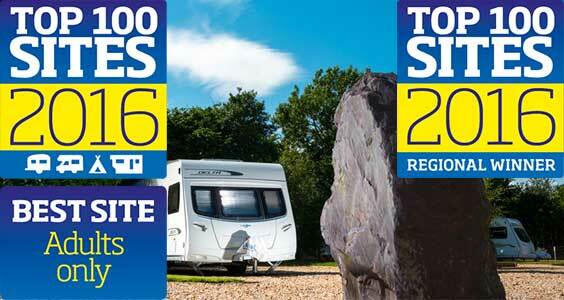 Regional Winner Somerset and Best Adult Only Caravan Site UK for the 6th consecutive year. We are truly delighted to be awarded Best Caravan Park in this new category. It is truly an honour to be among the Top 100 Sites awards every year since 2000. 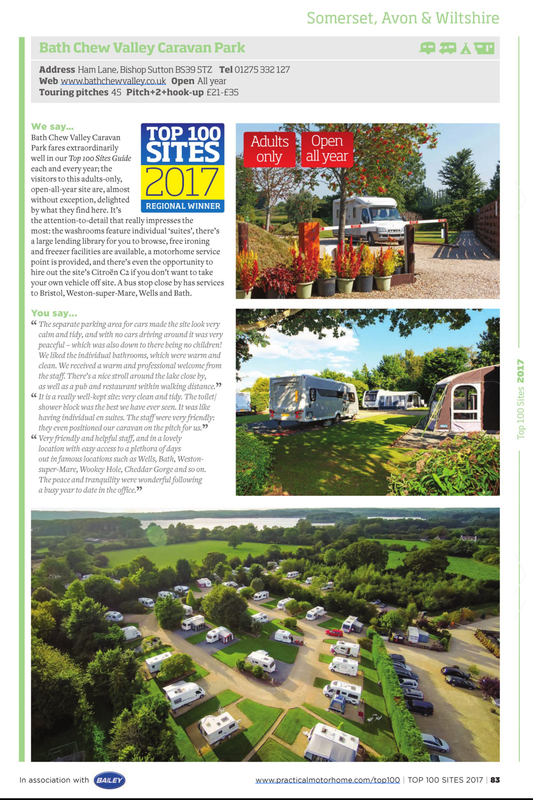 "Staying at Bath Chew valley Caravan Park was like staying in someone's private garden with all the trees and shrubs. Being able to hire a car on an hourly basis was a bonus"
"We loved the friendliness of the caravan park staff, the efficiency of the whole operation, the wonderful landscaping and amazing washblock! Also great was the proximity to brilliant pub food and great sights"
"You arrive, check-in, the staff put your caravan on pitch and they move it when you leave. Each bathroom has a handbasin, shower, toilet, hand and hairdryer. The information room has a library too." We're now the only park ever to be awarded OVERALL WINNER for Practical Caravan & Practical Motorhome in two consecutive years and three times overall! Plus we've been among Practical Caravan's Top 100 Parks awards every year since 2000!